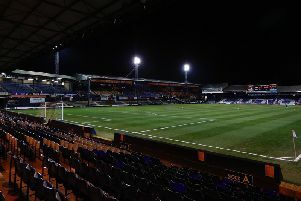 Luton boss Nathan Jones was left purring by his side’s first half display as they saw off fellow promotion chasers Exeter City at Kenilworth Road this afternoon. Harry Cornick’s goal on 38 minutes ensured Town were triumphant as they produced a performance of almost total dominance at times. Speaking afterwards, Jones said: “I'm delighted as firstly we bounced back from the disappointment of Tuesday (losing to Wycombe), when we were wonderful going forward, but we didn't defend as we normally do. "Today we were back at it defensively, I'll have to watch it back to get pure clarity on it, but I thought that first half performance was as good as we've done here, in terms of fluency, in terms of how we moved the ball. "Because we're up against a good side in Exeter, they're vying for promotion, they want the same things as us, but I thought we were in total control. Jones made three changes to the side for the clash, handing debuts to Jake Jervis and Flynn Downes, while with Cornick back too, he swapped to the 4-3-3 with Jervis and Cornick either side of James Collins. On why he made the alteration, the Luton chief added: “I just wanted a little bit more penetration. “The other day I thought we were very good attacking-wise, but we were done with two counter attacks and a set play, so I didn't want that to happen and we worked on those things. “We can change, we have two shapes we work on and with the personnel we had available and with bringing new ones in, we felt that we did. “Plus we played against Exeter down there and won 4-1, playing with three up top and we felt that was the way to go and that proved.